With its unique SQUIRREL STINGER, Wild Bills Anti Squirrel Bird Feeders train thieving squirrels (and raccoons) to eat elsewhere. Does the feeder harm the squirrels? When an animal touches two metal contact points at the same time, an electrical circuit is completed and a mild correction is delivered. This is similar to the static shock you sometimes get when walking across a carpet. The correction delivered by the WildBills™ Squirrel-free Bird Feeder merely surprises the squirrel and does not hurt squirrels or other animals in any way. Do the birds feeding receive a shock? The WildBills™ Squirrel-free Bird Feeder is incapable of adversely affecting a bird because of a bird's physiological characteristics. Bird's bills, feathers, and scale-covered feet insulate their bodies. Even under extreme wet conditions, the oil on a bird's feathers, combined with other physical characteristics and the air trapped by their feathers, prevents any electricity from reaching their body. Can I be harmed by the feeder? Although the correction is not harmful to your health, it may startle or surprise you. It is best, therefore, to make sure that the WildBills™ Squirrel-free Bird Feeder is turned OFF whenever you are filling or handling the feeder. Also be sure to always keep the bird feeder out of the reach of children. A new 9V alkaline battery lasts about 3-4 months. This will depend on the number of static corrections delivered. If there is an unusually high squirrel population, battery life will decrease. Always use a high quality battery. What if my feeder stops working? Change the battery. Check all the connections to make sure all wires are connected properly. Clean all the metal parts with a scotch brite pad. The oil from the seed causes a film to coat the metal parts, which acts like a insulator. This is a very common problem. Always clean your feeder before filling it. It rained or snowed for the last few days and now my feeder isn't working. Why? The feeder will only provide a static correction when a circuit is completed. The circuit is completed when two metal contact points are touched at the same time. In weather where rain, snow or ice remain on the metal parts the circuit can not be completed. If this happens there is a continuous correction for about 3 seconds, then the fail safe switch shuts down the feeder until the condition is corrected. This is NOT a malfunction. The 9v circuitry was designed to turn off after 3 seconds of continuous operation to keep the battery from draining and to insure that an animal would not be harmed if it was inadvertently caught in the feeder. When the wet weather stops and the feeder is dry, the fail safe resets. To ensure proper operation after severe weather, we recommend that you turn the power off and thoroughly dry the feeder. Remember to turn the power on again after the condition has been corrected. - hang the Wild Bills Electronic birdfeeder hook from a metal object unless you insulate it first with electrical tape or a piece of hose. 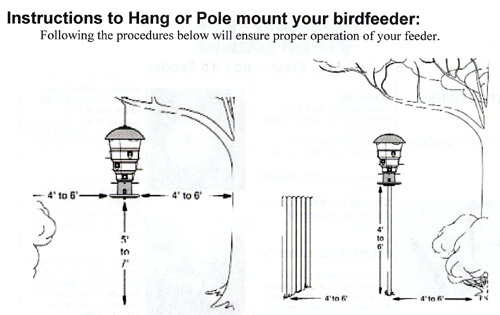 - hang your feeder on a shepherds hook - the squirrels can get on the feeder, bypassing the electronics that cause the correction. - it takes two metal contact points to create the static correction. A squirrel can feed on the seed tray as long as it does not touch the metal perch, that's why it is very important to follow the hanging instructions, so the squirrels do not get on the feeder! - turn your birdfeeder off when doing any type of maintenance such as cleaning, filling or replacing the battery.